History is always a subject I have a hard time planning for my family, so I’m glad I was able to review a new study from Home School in the Woods. 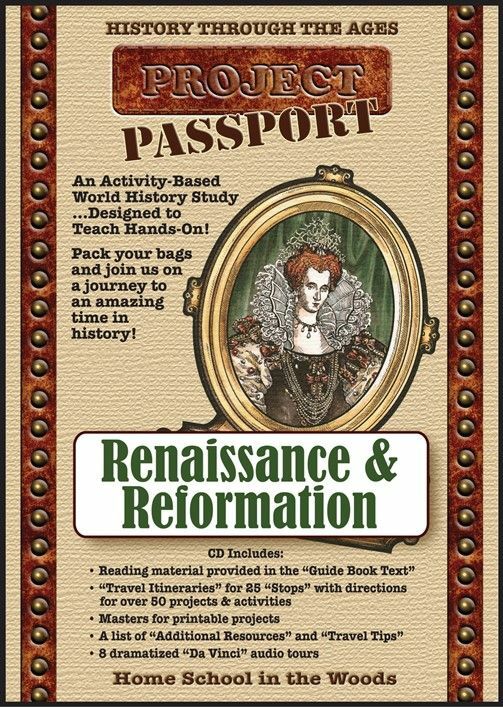 We got to download and try the HISTORY Through the Ages Project Passport World History Study Renaissance & Reformation. Project Passport is a product that can be either downloaded as a zip file or purchased on a CD. We got the .zip version. It contains everything you need to teach your kids about the topic in a fun and hands-on way. There are lots of printables and your kids will be learning in many different ways, through writing, reading, listening, and even participating in projects and activities to put them into the time period they’re studying. It’s recommended for kids in grades 3-8, but could easily be modified for younger or older students as needed. As it mentioned, there are 25 “Stops” in this unit study. Each Stop has Guide Book Text, which acts as your text book. Each Stop also has a Travel Itinerary, which tells you exactly what you’ll need to have printed out for each lesson (and how to do it, which includes photos), and what reading and activities need to be completed for the Stop. It really lays it all out for you. I printed every single thing out ahead of time last time we used one of these studies, and it was just too much and too overwhelming initially! THIS time, I chose to only print as I needed to so that my kids wouldn’t see these huge 3″ binders of info and freak out. They did great with us working on bite-sized assignments each session. Home School in the Woods is all about kids working on subjects in a hands-on kind of way, it seems, as there’s tons of notebooking and lapbooking activities to make history come alive. I appreciate that it isn’t a standard history course with essays and tests and that kind of thing. This is a way for my students to learn and demonstrate that knowledge in a more creative way. You can do one Stop a day, one Stop a week, or even spread the Stops out longer if you want to. Since there are 25 of them, it would be easy to stretch this out to be a full year curriculum by doing one per week and adding in several days of extra reading of living books or watching documentaries about the time period or place. There is even an Additional Resources document int he Project Passport to help you pick these types of things to beef it up more or to satisfy your child’s curiosity! Alternatively, you could do it all in one semester by working through it quickly and completing the Stops quicker. It really is flexible and completely up to you. We chose to work through this Project Passport slowly. While there aren’t many pages of reading for each Stop, the pages are packed with information and not busy with illustrations. It worked best for us to read about a third of the Guide Book Text per day and split the activities up over a few days. In fact, during this review period, we only completed the lessons through the 4th Stop. I combined my 4th and 6th graders to do this, and I included their 1st grade brother as well. All of them really enjoyed the Audio Tour in Stop 2 about a day in Florence. They love audio books, so this was right up their alley. We also got to explore some art techniques and learn more about Da Vinci. I love how these lessons hook you in right away and don’t save all the good stuff for last! It’s ALL good stuff. Looking ahead, we’re going to get to learn about art techniques, music from the time period, Shakespeare, Galileo, Magellan, Martin Luther, practice mapping skills, and even play a fun game called Mercenary Madness! I really love that Home School in the Woods provides such a rich learning product for kids. I don’t particularly love to teach history, but these units make it easy to make history fun for my kids anyway. They are able to participate in unique experiences and get their hands on some cool projects totally related to the time period they are studying. You really do feel like you’re taking a trip back in time and feel like you can relate to the people living back then. I’ve previously reviewed a few other things from Home School in the Woods, including another Project Passport study, Ancient Egypt, as well as a smaller unit study on US Elections. Feel free to check those out, as well as seeing what other families thought by clicking on the banner below. I also noticed that they’ve come out with a new one since last time I reviewed for them for Ancient Greece and one for Ancient Rome is in the works and will be released sometime in 2018.